After learning woodworking from his father, Bob Gilsdorf shares the fun with kids everywhere. 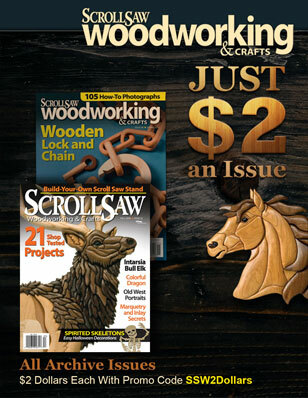 Woodworking has always been a multigenerational craft for Bob Gilsdorf. During Bob’s childhood, his father had a small woodshop and was always working on furniture and other projects, showing Bob the ways in which wood could be miraculously transformed into new objects. 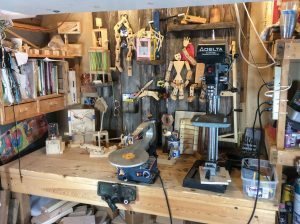 This creative environment sparked a strong early interest in woodworking: when Bob turned ten years old, he told his parents that what he wanted for his birthday was to build something. His father designed a gravity-powered go-kart and presented Bob with the pieces. Although nothing more than a pile of wood, four wheels, and a salvaged steering wheel, it was “the ultimate gift” to Bob. 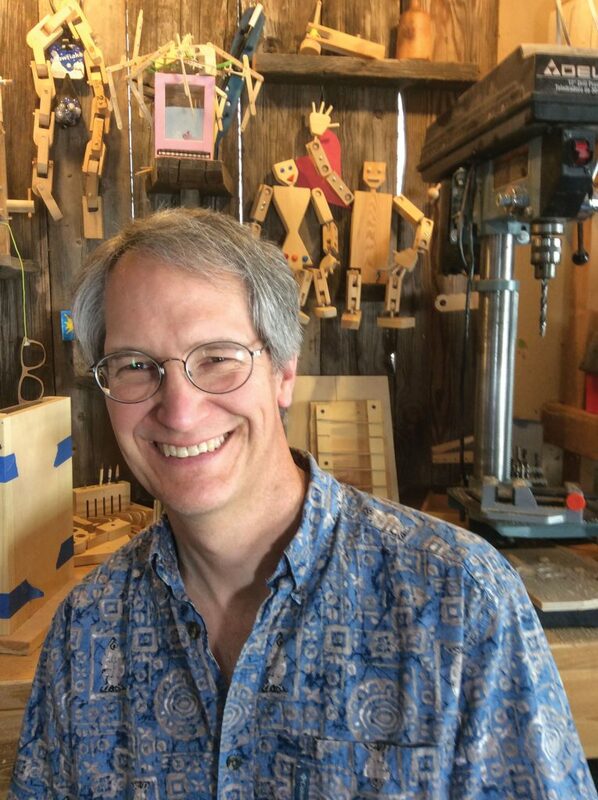 His interest in building and creating grew in imaginative directions after his mother gave him his first book on crafting wooden toys. He began to focus on that subject, enjoying the fun of projects that could be both built and played with. A glimpse into Bob’s workshop shows tools, prototypes, reference books, and a few designs contributed by his five children. 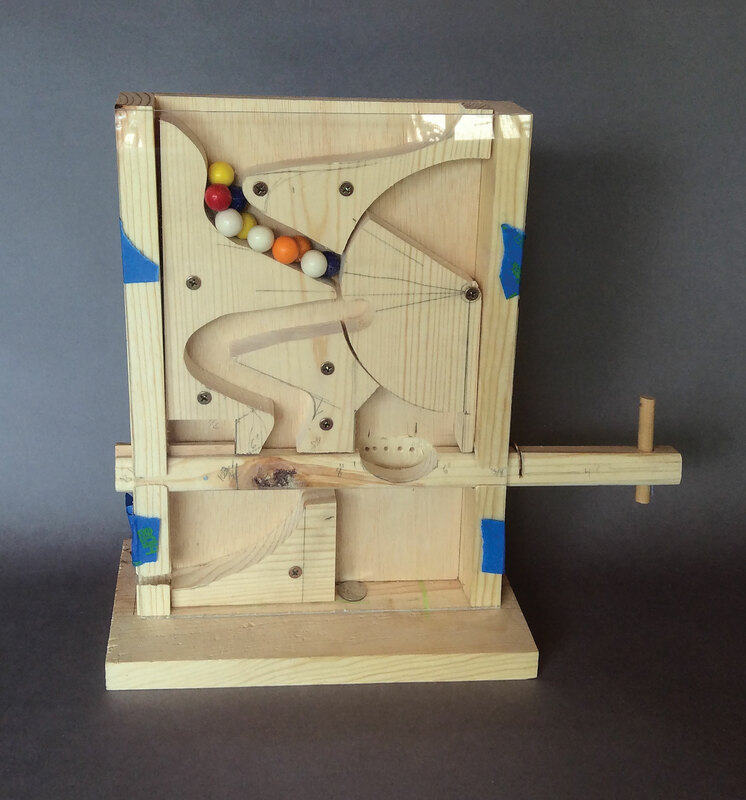 This gumball machine is one of the projects on Bob’s workbench. Bob’s ideas for toys come from a variety of places. Some have simple kinetic origins: the idea for the quarter flipper came about when Bob found himself flipping a quarter over and over, trying to make it spin faster and launch higher. Could he replicate this motion with wood? Likewise, his ping pong ball launcher originated in the manual flick of a ping pong ball and the stinging fingertip which resulted. Was there a way to enjoy the flight of a flicked ping pong ball without the pain? 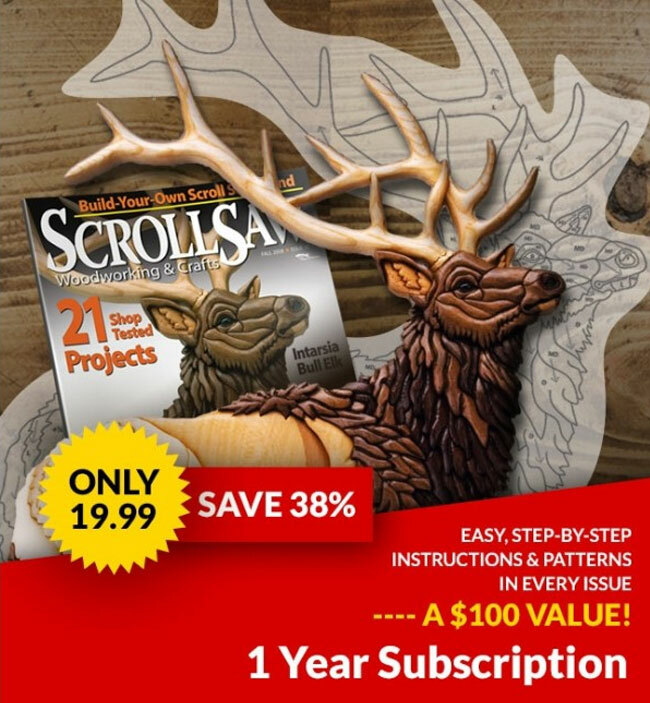 In other cases, Bob’s ideas are born out of the wish to make a completely one-of-a-kind toy as a gift for a particular person. But for the most part, Bob says, his ideas don’t simply appear out of the air; rather, they arise from time spent sitting down with a blank page, intentionally brainstorming new mechanisms to explore or setting new challenges to overcome. 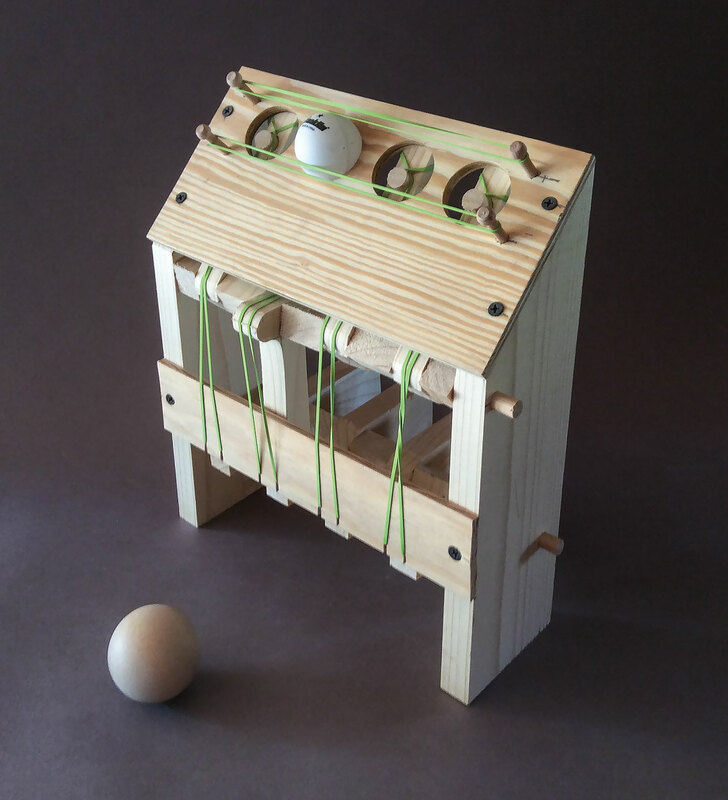 Sometimes the idea is specific: replicating the mechanism of a clicking ballpoint pen in order to launch a ball. Other times, it’s less clear-cut: figuring out how to dispense a gumball without using one’s hands. This ping pong ball launcher is another project Bob is working on. Once he has an idea, Bob goes on to determine what the toy will do and what it will look like, keeping an overall goal of making the toy easy to build. He spends some time creating sketches which help him to work through the details of the design, then uses those sketches as he constructs the prototype. Unafraid of failure, Bob takes a relaxed approach to measuring and assembling the toy, working things out as he goes along. If a prototype doesn’t work out, he holds on to it. In his own words, “I like to keep the misfits around because they taught me something and might inspire something better.” Next, the prototypes are tested—first by Bob himself and then by his five children, who enjoy discovering what the toys do and how they work. From idea to final product, some of Bob’s toys are years in the making, depending on the complexity of the mechanism. 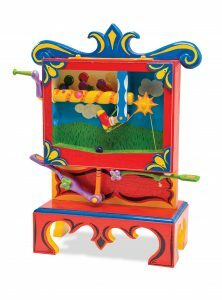 Using wood as a medium adds certain difficulties to the process: it can be hard keeping the toys “toy-size,” as wooden latches and hinges become weak when made too small. However, Bob says, wood is a great medium for toys because of its relative strength and shapeability. 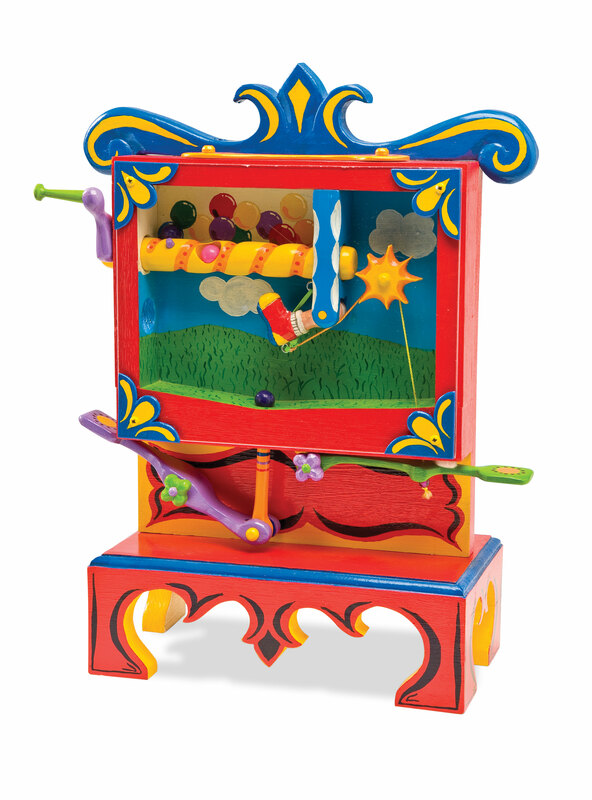 Visit the Fox Chapel Publishing website to check out Bob’s books, Zany Wooden Toys and Zany Wooden Toys Reloaded. Click Here to discuss this article on our forum.